In the pulp magazines and comics of the 1950s, it was predicted that the future would be one of gleaming utopias, with flying cars, jetpacks, and robotic personal assistants. Obviously, things didn't turn out that way. But the world we do have is actually more fantastic than the most outlandish predictions of the science fiction of the mid-twentieth century. The World Wide Web, pocket-sized computers, mobile phones, and MRI machines have changed the world in unimagined ways. 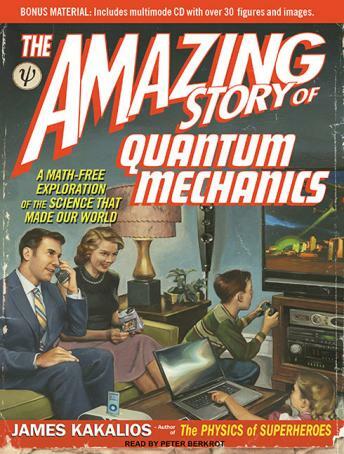 In The Amazing Story of Quantum Mechanics, James Kakalios uses examples from comics and magazines to explain how breakthroughs in quantum mechanics led to such technologies. The book begins with an overview of speculative science fiction, beginning with Jules Verne and progressing through the space adventure comic books of the 1950s. Using the example of Dr. Manhattan from the graphic novel and film Watchmen, Kakalios explains the fundamentals of quantum mechanics and describes nuclear energy via the hilarious portrayals of radioactivity and its effects in the movies and comic books of the 1950s. Finally, he shows how future breakthroughs will make possible ever more advanced medical diagnostic devices-and perhaps even power stations on the moon that can beam their power to Earth.